Highlights of Roger Federer against Novak Djokovic in the semi-finals of the Paris Masters. Novak Djokovic edged out Roger Federer in a high-quality Paris Masters semi-final to set up a meeting with Karen Khachanov in Sunday's final. The Serb continued his dominance over the Swiss legend and remarkable return to form with a 7-6 5-7 7-6 victory in three hours and two minutes. The victory marks the first time in the pair's 47-match rivalry that Djokovic has won four successive matches. Djokovic, who has been feeling unwell this week, has not suffered defeat since a third-round defeat to Stefanos Tsitsipas in Toronto and since then has won a pair of Masters titles in Cincinnati and Shanghai while also picking up his second Grand Slam of the year at the US Open. He will now have the chance to mark his return to the world no 1 ranking on Monday with a fifth title of the year. Federer's hopes of becoming just the second man to record 100 career titles will move on to The O2 and the ATP Finals and his chance of ending the year as the world No 1 is also over. 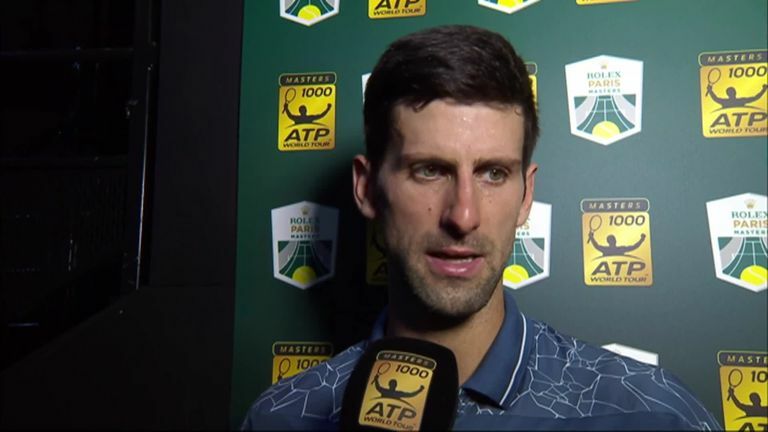 Novak Djokovic said his semi-final at the Paris Masters against Roger Federer was the best he has ever played against the Swiss after he won an epic match. Earlier in the day Russia's rising star Khachanov continued a spectacular week with a 6-4 6-1 demolition of world No 8 and sixth seed Dominic Thiem that saw him through to his first Masters final. Thiem's run to the last four and Kei Nishikori's defeat to Federer mean that Thiem's place at the season-end ATP Finals was already assured and it was a hungrier Khachanov who cashed in with a straight sets victory. The 22-year-old Russian's three previous finals have all been at 250 level and, having won them all, he will hope to add the biggest title of his career so far. But he faces arguably the toughest of tests with Djokovic looking like the man who held all four Slams at the same time in the summer of 2016. Federer has only once beaten Djokovic when losing the first set so the opener already had a feel of importance before the match begun. A 71-minute first-set tussle ensued, Djokovic fashioning the first break points of the contest in the eighth game. With the game approaching the 10-minute mark, Federer, who had already fended off three break points, gave Djokovic a fourth chance with a wild forehand. But a stroke of Federer genius - a volley with the back of his racket while looking away from the ball after a net cord loop - saved it before the third seed held on at the end of a 20-point marathon. The pair traded a couple of routine holds before heading into the tie-break where Djokovic prevailed against a tentative Federer, who led 4-2 with the first mini-break and fired a forehand into the net with the court open in front of him. Djokovic didn't need a second invitation and won six of the next eight points to take the opener. The quality went up a notch in the second set, the pair each staving off early break chances in their opening services games, and as time ticked on a second tie-break seemed inevitable until Federer chose his moment to pounce. Having saved an eighth break point of the contest to lead 6-5, Federer forced a window at 15-40 and took it to let out a roar and level the contest which was already into its third hour. Djokovic raced out in the decider trying to assert himself early but once again Federer dug deep and the pair were inseparable until the closing stages of the set. With 10 break points wasted, Djokovic forced another two at 4-4, when Federer saved both the Djokovic response was to smash the racket into the arena floor while his opponent closed out the game to move within a game of the match and a first win over the Serb since 2015. In such a quality contest it was inevitable that the match would be decided by a tie-break and Federer handed the initiative to Djokovic with a wild forehand and then a second double-fault of the match to give the Serb a 4-1 lead. As the match entered its fourth hour, Djokovic brought up five match points, Federer saved the first two on his own serve but fired into the net to give his opponent a place in Sunday's final. There was much to cheer Federer in his performance ahead of his return to The O2 while Djokovic continues to rekindle the formidable form that has taken him to 14 career Grand Slams and 32 Masters titles - one short of Nadal's record which he can level on Sunday. Watch the Paris Masters come to a conclusion with coverage of the final underway on Sky Sports Action from 2pm.